And then there was four. 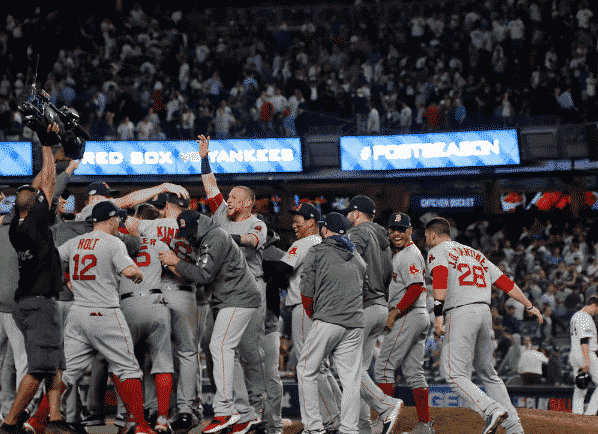 Two American League teams and two National League teams are left in the MLB postseason. The winners of the NLCS will go on to play in the World Series. It is a series that every baseball kid grows up dreaming of and for some players, it could become a reality. Here are your four teams that are left standing for both the ALCS and NLCS. The Milwaukee Brewers and Los Angeles Dodgers will meet in the NLCS that starts on Friday at 8:09 PM Eastern. In a surprising turn of events, Gio Gonzalez will get the ball for the Brewers while the Dodgers will counter with Clayton Kershaw. Gio has yet to pitch in the postseason for the Brewers but he still has a lot of experience. The Brewers will then go with Wade Miley for Game 2 followed by Jhoulys Chacin for Game 3. As for the Dodgers, they plan to go with Clayton Kershaw for Game 1 followed by Hyun-Jin Ryu, Walker Buehler and Rich Hill. The Dodgers also have an outstanding bullpen so there shouldn’t be a problem if they are forced to go to them early. Both bullpens are also fantastic. The Dodgers and Brewers rank 1 and 2 in relievers’ ERA since the start of September, led by the Brewers’ sparkling 1.89 — nearly a run better than the rest of the pack. Josh Hader, Jeremy Jeffress, Corey Knebel and Joakim Soria are a few of the solid contributors in the Brewer bullpen. The Dodgers have been as good in that department. Kenley Jansen has been at his best since his tragic heart scare. Kenta Maeda and Pedro Baez have become very good setup men and Ryan Madson has shown how valuable October experience is in this time of year. The Dodgers and Brewers both did very well in the divisional round. LA dispatched Atlanta in four thanks to stellar pitching as well as a timely 3-run bomb from Manny Machado. Meanwhile, the Brewers swept the Rockies in comfortable fashion. The Brewers have also won eleven straight games heading into this series so they are hot right now. This is also a very interesting series. Boston has been the best team in baseball for the vast majority of the season but the Houston Astros are still the defending champs. This will mean that Boston will not have it easy against them in any way. The Red Sox have an excellent rotation. Chris Sale has been the anchor of the rotation while David Price, Rick Porcello and Eduardo Rodriguez cap off an excellent rotation. The bullpen has also been a threat led by Craig Kimbrel. They also maintain two MVP candidates in their lineup in Mookie Betts and JD Martinez. Boston has all of the pieces to win it all this year but it won’t be easy to get there. Meet the Houston Astros. A team with an even better rotation than last year by trading for Gerrit Cole. Houston also fixed the bullpen woes by trading for Roberto Osuna. Their hitting core remains the same with players like Jose Altuve, Carlos Correa and Alex Bregman leading the charge. This will be a very fun series and nobody really knows how both of them will play out.